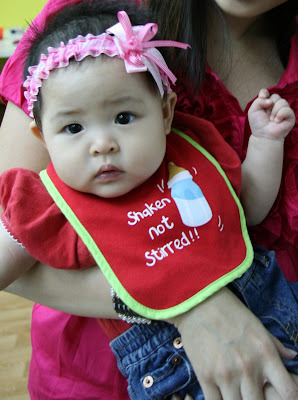 Over the weekend, we were invited to baby Giselle's 1st Birthday celebration. And to make sure Jayden went neat and proper, we decided (or rather, Mummy decided) to STYLE his hair for the first time. Look at how much she has grown the last time she attended Jayden's birthday party! Baby gals are sooooo adorable!! Of course, the wax couldn't keep the hair down for long. But we thought the hat was quite a neat trick.